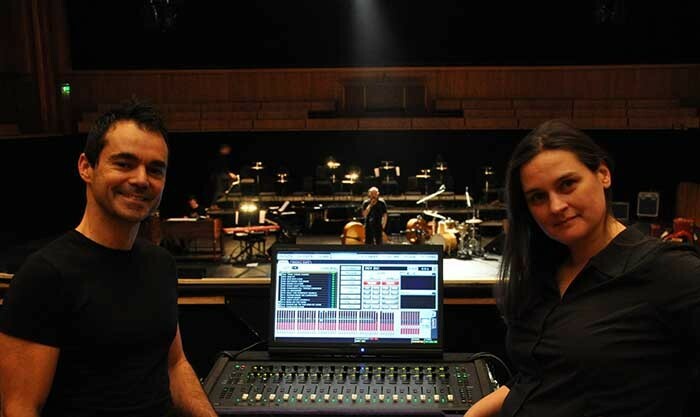 UK - Mixing engineer, Gerard Albo, whose credits cross every genre and extend from Amy Winehouse and Anastacia to the Luxembourg Philharmonic Orchestra, chose the new Avid S3L for the current Madeleine Peyroux UK tour. With Peyroux’s unique style and a voice that has carried her from busking on the streets of Paris to mainstream recognition, the tour embraces her much-loved songbook of reworked and contemporary classics. The tour venues included a sell-out concert at the Royal Festival Hall for the last night of the London Jazz Festival, where she was supported by Manchester-born singer, Josephine. Gerard Albo has worked with Avid since 2006, when he first used a Venue console for Corinne Bailey Rae. The software gave Albo the method of working and results he wanted and it became the start of his long term rapport with Avid's Sheldon Radford, senior product manager for Live Systems and Consoles group, and Andy Huffer of Avid Venue distributor, HD Pro Audio. After only three gigs, Albo is passionate about the new console. "I had discussed the possibilities of such a console with Sheldon for many years, and the S3L has given me everything I expected and hoped for; the compatibility and familiarity of the software combined with the greater flexibility and functionality I had always wanted. As my fluency with the S3L increases I now find myself frequently using the touchscreen that Andy packaged with the console, which further expands the flexibility and speed of work. Within a package of this size and weight it is a remarkable product," he says. "When Andy Huffer offered me the possibility of using the S3L for this tour I jumped at the chance, even though the timescale was tight and we wouldn’t have time to soundcheck the first concerts. Such was my knowledge of the system’s operation and confidence in Avid that we loaded up a previous show file programmed on a Venue Profile and it performed perfectly," said Albo. "My personal relationship with the artists I work with is essential for me. My love of the music and their interest in the part the sound plays is very important and Madeleine was totally involved with the decision to use the S3L. She is an artistic perfectionist and surrounds herself with the most talented performers, but also gives a lot of attention to the technical side of her performances." Andy Huffer commented on the S3L: "We’re very impressed with the new console and these first gigs have proved its flexibility, ease of operation and superb sound quality. With outstanding operability and functionality, the S3L is so much more than just another size and price point. One of the major benefits of the S3L concept is that it can mix a live show while recording directly to Pro Tools, and the S3 control surface can then be used later as a Pro Tools controller for mixing, overdubbing, and other session requirements." Huffer continues: "With a design goal to be small and light, it meets the need in today’s music business where performing artists have to work harder than ever to capture revenue from live shows and recorded works in tandem. The S3L is small enough to be carried onto the tour bus and up to the hotel room, or transported as additional baggage. As a package it has no equal."